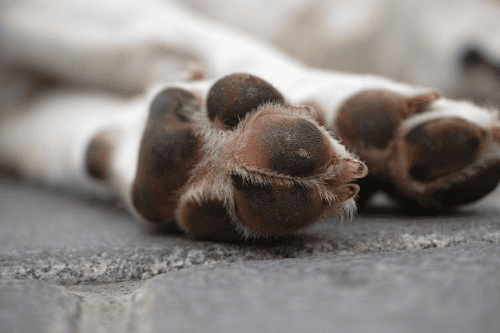 How To Treat A Paw Pad Injury? Owning a dog can be very fun, but there are some things that you must be mindful, such as paw pad injuries. Paw pad injuries can occur when you least expect it. Some common signs of paw pad injuries include limping, bleeding, licking at the foot, discoloration, and reluctance to put weight on the paw. At Bark ATL’s cage-free overnight dog boarding facility, we are sharing tips on how to treat a paw pad injury if it ever occurs. Paw pads are thick rubbery cushions on the bottom of your dog’s feet. Dog’s rely on their paw pads for shock resistance, to create traction with the surface they walk on, and to insulate their paws from very high temperatures. It’s imperative that you pay attention to the surface that your dog walks on. Surfaces such as concrete, rock, gravel, and sand can injure the paw pads. Once you notice your dog has an injured paw pad clean the wound. Look for debris or any foreign objects such as glass, metals shards, or wood that could be stuck within the paw pad. Use tweezers to gently remove any particles or run cool water over the paw to dislodge them too. If the foreign object is lodged too deep in the wound, it will need to be removed by a veterinarian. Once the wound is cleaned, you must control the bleeding. To control bleeding, you must apply pressure to the wound with a clean towel and ice pack. If it is a minor tear, the cut will stop bleeding in a few minutes. For larger wounds, it will take longer to stop bleeding. If bleeding last longer than 10-15 minutes take your dog to an emergency veterinarian. Now that you have controlled the bleeding you must contain the wound. Cover the paw pad with a gauze pad to absorb blood and cushion the bottom of the foot. Then, apply the bandage. After the wound is contained remember to change the bandage daily. If your dog tries to chew on the bandage apply an anti-lick product on the bandage. Make sure that you keep the bandage dry to ensure proper healing. If the paw pad becomes swollen, dusky, or releasing a foul odor contact your veterinarian.